I’ve had to wait a while between finishing this novel and attempting any sort of review. Ultimately, I think this is a great book, but it took me almost 2/3 of the book to reach that conclusion. …may contain some true grain of truth, but I just didn’t want to be stuck there with Shriver. When it comes down to it, Kevin’s actions and his mother’s reactions struck a real chord of fear in me. Of course I’m afraid one of my sons might do “something unforgivable.” It’s my worst nightmare. So to read about that, was discomforting. 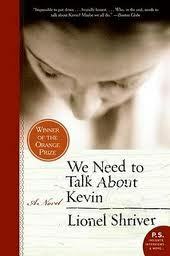 Kevin’s mother Eva tells the entire story through a series of letters to her husband, Kevin’s father. These letters take the tone of confession, but I couldn’t bring myself to like Eva. She hates her son and I just can’t find a place in my mind or heart for that . I also wanted to feel empathy for Kevin despite his deeds, but the epistolary style only allows us t know him through his mother’s eyes. Suddenly 200 pages into the book, I was hooked. I wanted, maybe needed, to understand the factors involved and the (gruesome) details of the massacre itself. I won’t try and convince you that it gets and brighter, but I did develop some sympathy for Eva. In a million years, with all the confessions and everything I knew, I still didn’t see the end coming. That is a wholly satisfying feeling when I read. “Liked” is not the right word to describe my reaction to the book since it left me feeling sick with horror and fear, but it deserves my four star rating. It’s a book I’ll never forget. I am so glad that you read and reviewed Kevin. I read it in February and it is still haunting me. Dark doesn’t even begin to address the way this story is told and the fears it evokes, especially in parent-readers. I, like you, plodded through the first 200 pages and then sped lightening fast through the rest. This is one realistically scary book. Not realistic, let’s hope. Just realistically scary. Have you watched the movie? Do it. And then we should get coffee for further discussion! I’d love to get together to talk this one out, but I’m not sure about seeing the film. I’m disturbed enough by the book; I don’t think I need visuals. Yep. It’s rare for a book to evoke a physical reaction in me, but this one sure did. Thanks Sheila. I have not built up the courage to attempt the film, but I am glad I read the book. I never guessed the ending either, and it made me feel bad about my comment on Goodreads where I said she thinks we give a crap. As my youngest son always tells me, “It’s only a book,” but I tend to think about how I would feel if I was in the situation I am reading about. I never cared for Eva either, but I did feel sympathy at the end. It would be so hard for a mother to go through everything she endured and then to have to live out her life wondering if she would have been a more caring mother to Kevin, would things have turned out differently. Actually, I think your change of heart is a great compliment to the author. She did a great job of turning our heads and hearts around. And, I’m with you and not seeing the movie right away. i’m too freaked out as it is. A difficult subject but this book creates interesting discussion points around all aspects of family. Don’t know that I could watch the movie, there’s enough of it in the news with varying circumstances to think about. I agree that I’ve had more discussion about this book than most others. Thanks for the comment Claire.